This review originally appeared in the online version of FREE! Magazine April 2009. Used with permission. As a die-hard Maiden fan since the age of thirteen, it certainly is a thrill to see one of your favorite bands on the big screen in thunderous 5.1 surround sound.Yes, I’m talking about the new film Iron Maiden: Flight 666, which captures the band onstage, backstage, and everywhere in between, during the first leg of their 2008 Somewhere Back in Time Tour. Released worldwide on the 21st of April, the documentary film chronicles probably the most logistically challenging undertaking in Rock history: outfitting a 757 aircraft (complete with Maiden logo) to fit the entire band, crew, and all their equipment; fly them to play 23 concerts, in 13 countries, on 5 continents (that’s 70,000 km or 50,000 frequent flier miles if you’re counting), and do this all within the span of 45 days. 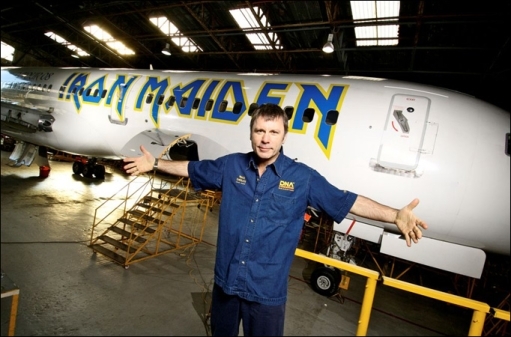 Oh … and I forgot to mention, the plane was flown by none other than Iron Maiden lead singer Bruce Dickinson (who is a licensed airline pilot in his own right). The film, by Canadian filmmakers Sam Dunn and Scot McFadyen, are the same team who made the fantastic 2005 documentary film: Metal: A Headbanger’s Journey. Considering the fact that Iron Maiden are well known for protecting their privacy and eschewing the typical trappings of celebrity, the filmmakers were given unprecedented access to the band on tour. We get to see affable drummer Nicko McBrain chatting (always with a slice of pizza!) with band mates on the bus moments after a show; the suffocating atmosphere brought on by mobs of fans in South America; Bruce in the pilot’s seat flying “Ed Force One”; the famously brusque band manager Rod Smallwood asleep on the plane; a moment of crisis brought on by an innocuous golf ball. In all, over 500 hours worth of film was taken by Sam Dunn and Scot McFadyen and then edited down to the movie’s final running time of 112 minutes. Of course, in addition to all the behind-the-scenes moments, we get to see the reason why Iron Maiden is renowned the world over: the band is a monster live act. The performance footage is mixed throughout the film and the band has never sounded better thanks to producer Kevin Shirley who mixed the sound for the film. Since the set list remained essentially the same, the filmmakers chose to show clips of the band playing one song from each city on the tour. Two songs are played in their entirety: “Aces High” and the perennial classic “Hallowed Be Thy Name” which is performed at the final show in Toronto, Canada, and closes the film. As much as Iron Maiden: Flight 666 is about the band, it is (even more so) a film about the fans. Across continents and cultures: India, Japan, Australia, Central & South America, the U.S., and Canada, we see the impassioned reactions of fans the world over. Watching the Colombian fans as they camp out for NINE days in a make-shift tent city before a show, leaves the viewer in awe of the devotion and loyalty shown by the band’s fans. I was actually at the Iron Maiden show in New Jersey in the U.S., so one personal highlight was to see some of the live performance from that particular show in the movie. I strained to see myself in the audience but trying to pick yourself out in a crowd of 20,000 can be a bit futile. I guess I could get myself a magnifying glass and wait for the DVD release! For a band that has made such an indelible impact on its fans around the world (and rock music in general), Iron Maiden is, astonishingly, not in the institution known as the Rock & Roll Hall of Fame. But Iron Maiden has never courted mainstream acceptance and that suits the band and its fans just fine. The band has made it on its own terms and without compromise. One particular moment in the film, I think, says it all: the camera zooms in on a Colombian fan who is overtaken by emotion and literally breaks into tears after capturing Nicko’s drum stick. This is what Iron Maiden means to its fans and no admission into an exclusionary club such as the R&R Hall of Fame can match that.